Metro’s Bike There! map — the most comprehensive map of Metro area bike routes — is now available online, with zoom, for free! Access the map here. Flash required. Zoom and pan in the interactive version of the Bike There! 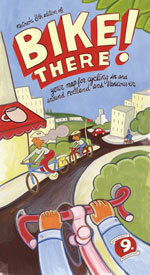 map to plan your next bike ride. For those times when you’re not near a screen, you can still purchase the eighth edition of the map printed on durable, waterproof paper for $9.